Cat Dream Extreme Deluxe (Blackline / Light Grey) is a limited edition cat tree from Europe’s leading manufacture of high-quality and robust cat trees, RHR Quality. And, the latest addition to the range! This amazing kitty construction has everything your feline friend you could ever wish for, all finished in a beautifully plush 600 GSM material that looks and feels incredible! 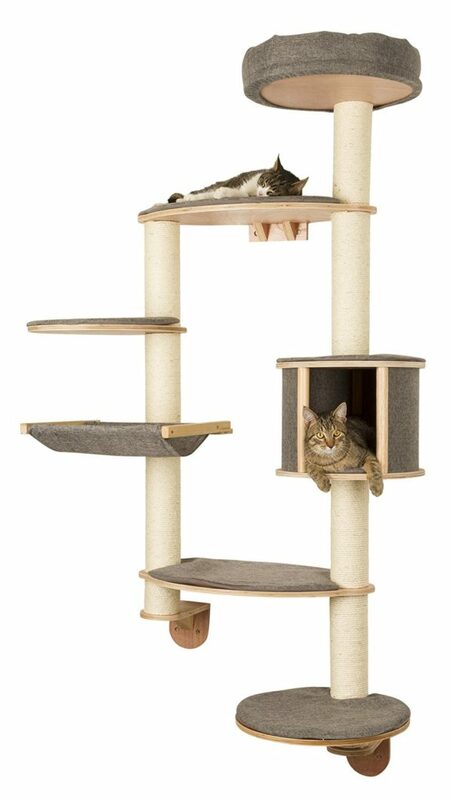 If you are fed up of having to replace your cat tree after it has been destroyed AGAIN… Then you should have no concerns whatsoever about the strength and stability of this monstrous piece of cat tree architecture! This floor-to-ceiling cat tree weighs well over 50 kg and can happily manage the weight of not only feline friends. But, as you can see from the pictures, a fully grown teenager as well! The hammocks are part of the new deluxe range and have been filled with a soft material so that they are extra cosy and have also been tested to hold up to 22kg in weight. Cat trees simply do not get any more robust than this and as the name suggests, this really is an absolute “dream” for your feline friend. The 5 cm thick playing rope provides another element of fun for your feline friends to stay mentally and physically stimulated and due to the height of this magnificent piece of cat furniture architecture, your cat will getting majestic view of the surrounding area and feel perfectly safe at all times. If you are looking for a cat tree that perfectly blends style with practicality then this really does stand out from the crowd on so many different levels! Talking of levels? The Cat Dream Extreme Deluxe (Blackline / Light Grey) has six different levels to climb and jump in-between providing them with plenty of physical activity which is especially important for an indoor cat..